Even if you can host websites directly from OPNsense, it is not recommended for security reasons - especially when sending requests to a local PHP interpreter. Do NOT consider using the feature to serve PHP content locally in enterprise networks. It is intended for home users who want to save money by saving power and know what they are doing. If you do not know how to handle a web server properly, do not enable this feature. First of all, a directory has to be created. For example /srv/web_application1 . Please note that this directory must be accessable by nginx and PHP (both running as www ). For example, you can chmod it (+rx for directories, +r for files for this user) or chown it. # 86 18009 drwxr-xr-x 2 root wheel 14050 512 "Aug 31 18:28:19 2018"
#  "Aug 31 18:28:19 2018" "Aug 31 18:28:19 2018" "Aug 31 18:28:19 2018"
Never use chmod 777 and be careful with write permissions. the most secure way is to change the owner to www ( chown www filename ) and give write permission only to the web server user ( chmod o+w filename ). The same is valid for directories. It would be a good idea not to execute anything in those directories (for example via a special location block in nginx). If you write your own applications, it is recommended to store such data outside of your web root. Press control + d to end the input. you can also use vim if you install vim-lite via pkg. In a real world scenario, you would probably copy an archive (.tar.gz, .tar.xz, .tar.bz or .zip) via SFTP or SCP on the firewall and execute a command to extract it. Read the man pages for tar, the compression tool or unzip for more detailed instructions. 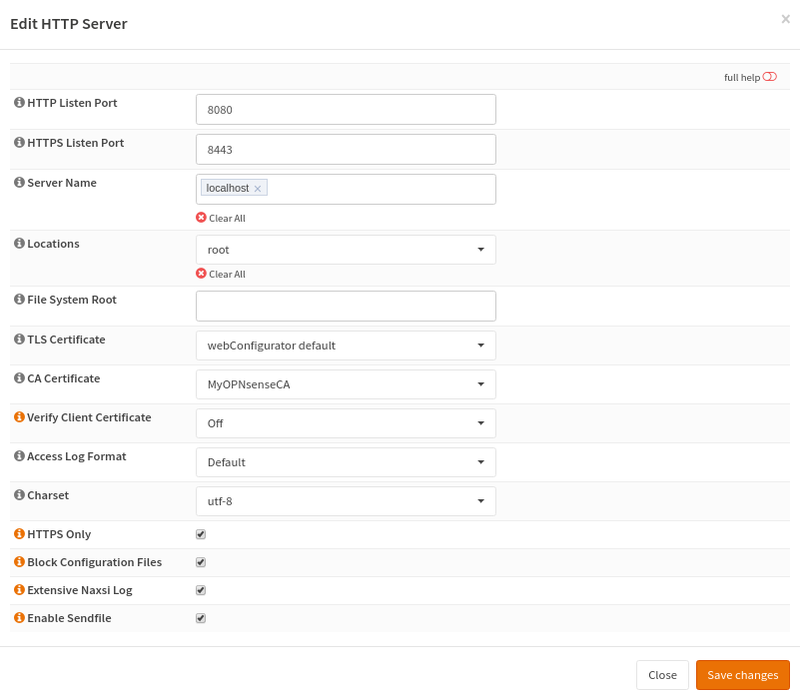 Configuring the HTTP server is simple. You need a hostname (for example website.test), a port (8080/TCP is the HTTP alternative port, so it is good for testing. For production sites you should stick with the defaults). Please select the prevously created location to serve web content. 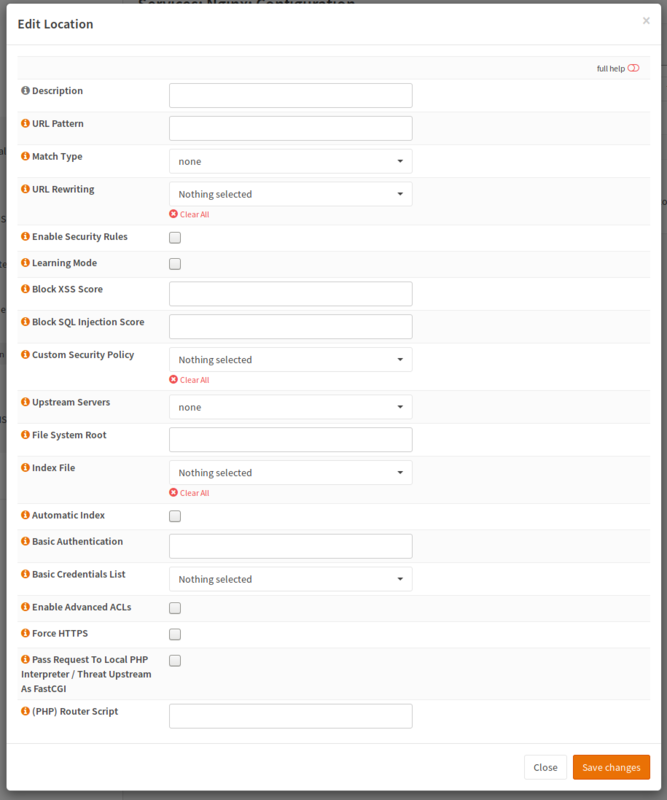 Please also configure a root here, because all requests, which do not match, will be handled by the server default. The default server will just serve the static file. To test if you web server is running, you can paste call it by its IP and port. Please note that IPv6 addresses must be enclosed within square brackets like http://[::1]/ or http://[::1]:8080/. This is nginx and not httpd. It will not care about your .htaccess files. Do not put secret data in unprotected directories. You can protect those directories by yourself, but make sure you don’t forget them. Some application depend on this file. Do not upload badly maintained software. If your firewall gets compromised, it will become easy to compromise your hosts too.